His parents divorced when he was about 11. His father, Robert, was a pediatrician, lawyer and hospital administrator, and he is now an executive at Mutual of Omaha. Chabon lived with his mother, Sharon, while she attended law school and established a career as a lawyer. Later in life, divorce and single-parenthood would become regular themes in his stories, often with men who either struggled with fatherhood or were bad fathers. Following a one-year stint at Carnegie Mellon University, Chabon transfered to the University of Pittsburgh, where he studied under authors Dennis Bartel, Eve Shelnutt, and Chuck Kinder. During his studies, Chabon formed a close friendship with Kinder, who had only just begun his 15 year work on a book titled Honeymooners: A Cautionary Tale. At one point, the novel comprised of three volumes, each about 1,000 pages long. Chabon got a glance at the enormous pile of paper and later used Kinder as the partial-basis for Wonder Boys‘s Grady Tripp. Kinder eventually cut the book down to about 400 pages and published it in 2002. In 1987, Chabon graduated from Irvine and married poet Lollie Groth. He also won a short-story contest in Mademoiselle. But perhaps more importantly, Chabon also finished his master’s thesis, The Mysteries of Pittsburgh, a novel he began in April 1985. Chabon never intended to publish his Fitzgerald-esque novel. However, his professor MacDonald Harris (Don Heiney) secretly sent the manuscript to an agent. Pleased with the novel, the agent took Chabon on and sold the novel to William Morrow Publishers for a $155,000 advance at a private auction, an incredible sum for a first-time novel since most average $5,000 to $7,500. The novel had its first printing in 1988 and was a great success. The success also had an unexpected twist: As the novel dealt with homosexuality, many came to believe the work reflected Chabon’s own homosexuality, a rumor that found its way into a Newsweek article. While Chabon has repeatedly said he was not gay, the rumor and the novel secured him a strong gay readership. Future novels and short stories would come to feature friendships between gay and straight men. Now a published author at the age of only 23, Chabon prepared himself to write his next novel, Fountain City, an epic of about baseball and architecture. Over the next five years, the novel grew to the enormous length of 1,000 pages, with his editor at Morrow, Douglas Stumpf, pushing him on. But as years passed and the book spiraled out of control, Chabon realized that the novel had no direction and had collapsed upon itself. He published a collection of previously-published short stories in 1991 titled A Model World as Fountain City continued to languish. Fearing becoming a one-hit wonder, Chabon turned his experience with City into his second novel, Wonder Boys. Released in 1995, the novel became a hit and was later adapted into a movie staring Michael Douglas. The movie bombed, though earned critical acclaim. His career wasn’t the only thing having trouble. Chabon’s domestic life endured dramatic changes during the course of writing Fountain City. He moved six times in during the five years of writing. He also divorced Groth in 1991. “My ex-wife and I had good times and bad times, fought and were silent, tried and gave up and tried some more before finally throwing in the towel, focused, with the special self-absorption of the miserable, on our tiny drama and its reverberations in our own chests,” he wrote in a short story, “The Hand on My Shoulder,” in 1997. Chabon lived with another woman before meeting his new love, Ayelet Waldman, on a blind-date in 1992. Waldman, a lawyer-turned-author, knew of Chabon’s reputation before heading into the date. “When he showed up, I said, ‘Thank you for the flowers, and are you gay? '” Waldman recalled to the LA Times. Three weeks later Chabon proposed. They married a year later. Waldman has published six novels to date: Nursery Crimes; The Big Nap; A Playdate with Death; Death Gets a Time Out; Daughter’s Keeper; and Love and Other Impossible Pursuits. The couple have four children: Sophie, Isaac, Rosie, and Abraham. Although critics loved Wonder Boys, Jonathan Yardley of The Washington Post ended his review saying that Chabon should set his sights higher. This echoed with Chabon’s own feelings, and with that in mind, he began work on his most ambitious novel yet. For the next five years, Chabon engrossed himself in the past, specifically regarding New York, comic books, and escape artists. Chabon feared the length of his new novel given his failure with Fountain City, especially since his style tended to allow plots to grow organically. But he trusted that his story of two Jewish comic creators and their attempts to escape and face reality would manifest itself into a working novel. The Amazing Adventures of Kavalier & Clay hit bookstores in the fall of 2000 to critical success. It was selected as a Notable Book of 2000 by the American Library Association and was a finalist for the National Book Critics Circle Award, the PEN/Faulkner Award, and the Los Angeles Times Book Prize. It went on to win the New York Society Library Prize for Fiction, the Bay Area Book Reviewers Award, the Commonwealth Club Gold Medal, and a little award called the Pulitzer Prize. Just as Mysteries of Pittsburgh brought Chabon a dedicated gay audience, Kavalier & Clay secured him a strong readership amongst comic book fans. 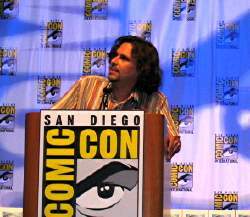 Chabon found himself as a guest at several comic conventions, and DC Comics invited him to pen a story for JSA: All-Stars #7 featuring his favorite character, Mr. Terrific. He also wrote a draft of Spider-Man 2. Perhaps most impressive was the publication by Dark Horse Comics of a quarterly anthology of comic stories featuring Kavalier & Clay‘s fictional superhero, the Escapist, titled Michael Chabon Presents: The Amazing Adventures of the Escapist. Kavalier & Clay also drew on Chabon’s Jewish beliefs, focusing on the struggles of being Jewish in America. It was not the first of his books to feature Jewish characters, as Mysteries of Pittsburgh featured Jewish gangsters and Wonder Boys had a surreal Passover dinner sequence. The Jewish Journal of the Greater Los Angeles reported in 2000 that Chabon is an active attendant at a Jewish Renewal congregation called Kehilla Community Synagogue and sits on the synagogue’s board. “It is through Kehilla that I see myself, at least in the foreseeable future, defining my Jewish identity,” Chabon said. Kavalier & Clay marked a turning point for Chabon not just in his writing style but also in his literary philosophy. Escape, a principle theme in the book, came to define Chabon’s next efforts. Gone were characters like Nathan Shapiro and Art Bechstein, young men seeking answers to love and life. Enter the Ethan Felds and Sherlock Holmes, who, while retaining the complexities of Chabon’s traditional characters, carried a more lighthearted feel. His next novels fully embraced the new sources of inspiration. He released a children’s novel, Summerland, in 2002 in which the literary worlds of fantasy were given an American twist. While not as successful as Harry Potter, the books it is most often compared to, Summerland proved Chabon could write for a young adult audience. He also edited McSweeney’s Mammoth Treasury of Thrilling Tales and its follow-up, published a short Sherlock Holmes novella called The Final Solution in 2004. His fifth novel, The Yiddish Policemen’s Union, chronicled a murder mystery set in an alternative history where post-war Jews settled in Alaska rather than Israel. Published in 2007, the novel remained on the New York Times Best Seller List for six weeks. Producer Scott Rudin optioned it and signed the Coen Brothers to adapt it into a feature film. Unlike authors of latter day, Chabon and Waldman have come onto the scene during the day of the World Wide Web. It’s a scene both authors have come to have seemingly love-hate relationships with. Chabon first set up a Web site at EarthLink as early as December 1998, according to records maintained by The Way Back Machine, an online archive of dead Web sites. It was a simple Web site, then called “Bumps on My Head.” An image map of a big head allowed visitors to navigate to unpublished stories, like his X-Men movie proposal, a site he built dedicated to Wonder Boys character August Van Zorn, and to a brief news section, among other features. It also contained his e-mail address. When The Mysteries of Pittsburgh was published in 1988, Chabon was only able to respond to fan mail after it was first snail mailed to his publisher. They would pile up, he later told The New York Times. “They became a big albatross for me,” Chabon said, adding that by the time he responded, “the person had already decided you are a jerk.” With e-mail, though, he could reply in a couple minutes. He included the address in the dust jacket flap of Wonder Boys; three weeks after it hit the stands, he had 150 letters. “I used to wonder if anyone ever noticed the little references or jokes or allusions in my books,” he said. With e-mail, though, readers were telling him they noticed. “It’s very gratifying,” he told the Times. Meanwhile, Waldman was beginning to get into the online game. With Chabon’s help, she put her own site online in 2000, featuring a children’s drawing for an image map. Called “The World of Juliet Applebaum” after the main character in her “Mommy-Track” series, the site at first mirrored Chabon’s in many ways, with a list of favorite books and a schedule. But soon she found her own niche, chronicling what she read. The site got a dramatic revamp in 2003. And thus Bad Mother was born. Waldman would post about her kids, her work, the day’s political happenings, and anything else on her mind. It was a personal side of her that had not been seen before, and could reveal exactly how much of herself had been put into her own characters. She later would say, in a column for Salon, that the blog was the first time Chabon realized his wife was having suicidal thoughts. The New York Times featured her blog in a January 2005 article about mothers who blog. But by that February, it became too much for Waldman, and she ended the blog when she landed a column at Salon. In April 2005, Chabon revamped his Web site, encorporating in Moveable Type, other blog features, and a slick design. He continued to update it with news and unpublished stories. But in November 2006, Chabon, suffering from Repetitive Strain Injury and bored of the Internet, shut the site down. Unlike with literature, Chabon has struggled to find success in Hollywood. He had pitches for movie adaptations of Fantastic Four and X-Men rejected; a script for a movie called Gentleman Host killed; and seen TV series ideas such as “House of Gold” and “Garageland” never hit the air. Chabon’s Spider-Man 2 script saw a rewrite by Alvin Sargent, and his adaptation The Amazing Adventures of Kavalier & Clay, his own novel, has gone through at least eight drafts to date with no production date in sight. In a 2000 interview with The Onion, Chabon explained that his movie writing was more about money than art. Things could also change with the release of Disney’s Snow and the Seven, a kung-fu remake of the Snow White tale, which Chabon helped write.